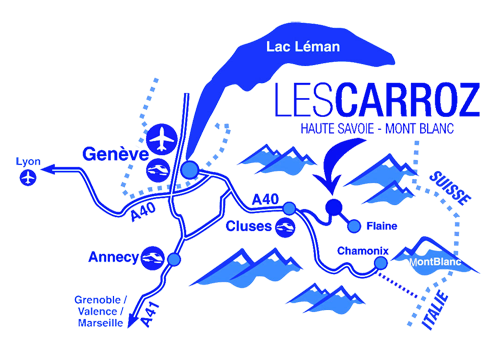 We’re just 50 minutes from Geneva Airport, with great access to wonderful skiing, here in Les Carroz and the wider Grand Massif ski area – the 4th largest in France. The chalet is fully catered, giving you more time for skiing in those all-too-short weekend ski breaks. To make things even easier, we can arrange airport transfers, ski lift passes, ski hire and lessons for you. Enjoy great food, a relaxed atmosphere and access to some of the most reliable snow you’ll find. Chalet Ascensus is in the traditional style of French mountain farmhouse, and perfect for a few days’ skiing in the week or for weekend ski breaks. Get in touch to ask about our great prices on short ski breaks. Please note that we don’t just provide ski weekends and midweek short ski breaks, you can come for whole weeks and more! See the availability and prices page for details. Like many catered chalets in France, no smoking is permitted in Chalet Ascensus. Generally cloudy. High near 0C. Winds light and variable. Snow during the morning will transition to snow showers during the afternoon. High -4C. Winds NNW at 10 to 15 km/h. Chance of snow 70%. Snow accumulating 3-7cm.